Yup. I think I’m 97.2% functionally recovered. Let’s hope it’ll be at least another year before I’m sick again. Apparently the best way to get hired is to attack the company and try to kill the job interviewer. 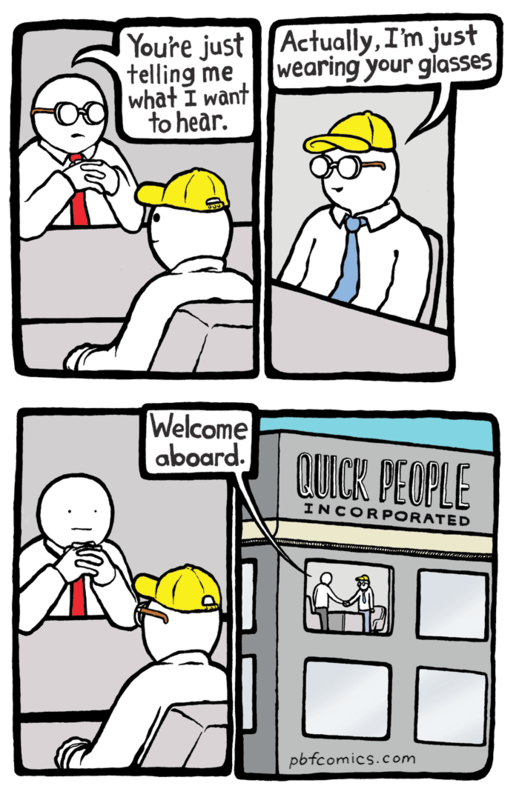 Some employers respect that kind of initiative. Especially if they’re confident enough in their defenses and counteroffenses. The semi transparent alien makes it obvious you’re feeling better – great news! Precarious self-employed freelancers of the universe unite, you have nothing to lose, well, apart from your identity as at least not being precariously paid employees, that is? Brilliant move. Emily is so good at her job, I’m jealous. … can you hire someone who hasn’t applied for the job? I mean, outside of certain rigidly defined historical paramaters which led to at least one civil war. can you hire someone who hasn’t applied for the job? You are a free spirit (with unpaid beer tabs). You are about to be offered a cushy (but soul-crushing) government job, likely with benefits. Do you trust yourself enough not to cave? Emily has out maneuvered them and put their own weaknesses into her hands just about. No one dies, no ships are destroyed. A really excellent outcome.